Are you stuck between SiteGround vs BlueHost to decide which one is the best web host to get reliable, stable, and fast hosting? So, to simplify this headache, I will go through both of these hosting providers and compare all the essential things that you should know before making a decision. This SiteGround and BlueHost side by side comparison is backed with real data statistics and tests. Let me clear one thing, I only share my personal experience with web hosts and the ones I had used or using right now. And these comparison posts are not sponsored by any means. However, I get a small commission as an affiliate when you buy something through my affiliate link, but it’ll not cost you extra charges. I already shared BlueHost vs. HostGator side by side review; there you can check speed test, uptime, Load Impact test, and hosting features comparison as well. Now in this post, I am going to share SiteGround vs. BlueHost as both companies have an outstanding reputation and a base of thousands of trusted customers. SiteGround and BlueHost provide an awesome hosting solution along with all the necessary features at the reasonable price. Their web storage features are quite similar to each other like both hosts allow limited disk storage (basic plan), free SSL certificates, and WordPress tools, etc. But SiteGround also offers some unique stuff such as SuperCacher to boost website speed, Pro-active monitoring, in-house data backup system, and LXC Linux technology. SuperCacher is an exclusive feature by SiteGround to improve site speed by creating website cache in multiple layers. 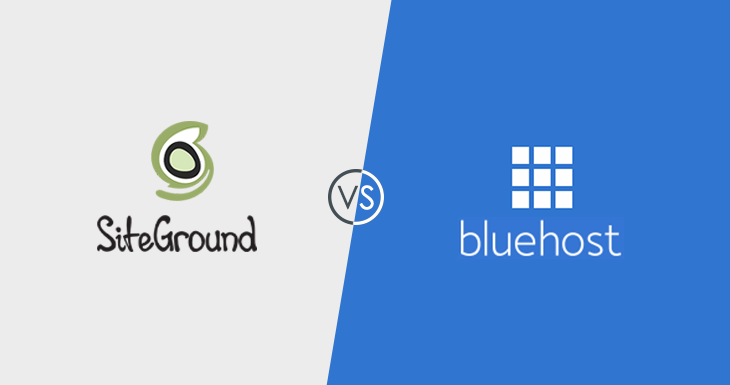 Anyhow, let’s compare all the essential features in this SiteGround vs BlueHost comparison in details. Let’s start with a short overview of both hosting companies. SiteGround is a non EIG hosting company operating independently, founded back in 2004 by some university students. They are managing more than half-million domain names and growing incredibly every passing day. It is one of the "BEST" WordPress hosts and has an outstanding reputation when we talk about customer support. The best part is their hosting servers are super fast, built with solid state drives, and powered by advanced CPU processors. All of their shared hosting plans includes HTTP/2 and free SSL certificate by Let’s Encrypt. Now, let’s talk about BlueHost, it is one of the top 20 web hosting services was founded in 2003 by Danny Ashworth and Matt Heaton. In 2010, it was acquired by Endurance International Group (EIG) and now operating under EIG management. BlueHost has a solid base of more than 2 million hosted domains and websites. They are one of the few WordPress.org recommended web hosts to start a blog using WordPress CMS. BlueHost is also a partner of WordPress, and that’s why they have exclusive tools to managed WP based websites. These tools help you install SSL certificate, create backups, handling updates, and much more. Which One is More Innovative? Web hosting is a much dynamic business in which companies have to implement and innovate latest things to survive as it’s very competitive business. You might know there are more than 15000 hosts available worldwide, so how one can survive without innovating exclusive features? Both BlueHost and SiteGround are one of the companies who uses cutting-edge technologies and latest hardware to provide unbelievable speed, security, and stable server performance. However, SiteGround looks more motivated and up-to-date when we talk about web hosting backed with unbeatable technology. SiteGround has a dedicated team of passionate geeks who loves to build latest technologies, and that is the reason they have SuperCacher, NGINX server technology, HHVM, HTTP/2 enabled servers and of course free CDN integration for better speed. NGINX is a great solution to improve site speed dramatically and work way better than Apache. On the other hand, BlueHost don’t offer any feature like SuperCacher or similar. But still, if you want to use it, you can install and configure W3 Total Cache plugin or WP Rocket to optimize website speed. My vote when it comes to inventing new stuff goes to SiteGround as they also have an in-house built backup system which allows easy restoration. Every internet user loves to browse fast loading websites, am I right? If your site takes too much time to render content, I am pretty sure your visitors would simply hit the back button on their browser. A slow loading site cannot sustain its position in search engine results which lead to low traffic and ultimately lost in revenue. So, let’s find out which host has fast hosting server and how much time it takes to load your blog. Here let me clear one thing, I installed WordPress on both hosts as well as W3 Total Cache plugin to get unbiased results. As BlueHost don’t have any feature like SuperCacher that is why I installed W3 plugin on both sites and avoided using the SiteGround cache plugin. I tested each host for three times using a speed tester tool “Pingdom”. If you don’t like to use it, here are some alternatives to Pingdom tool to check your website speed. SiteGround integrated their platform with cutting edge LXC (Linux containers) technology to handle sudden traffic spikes and stable your server when it gets huge traffic. It is resource efficient and prevents from downtimes due to heavy server load. In Shared hosting, hundreds of user consume the same server resources, so if one account start consuming high resources, it affects the performance of other websites terribly. It happened quite often in shared hosting but thanks to SiteGround as their hosting empowered by Linux containers to provide unbeatable uptime. Along with LXC technology and secure account isolation, they also monitor your hosting server with in-house built monitoring system for maximum uptime. This Pro-active monitoring system detects not only current server issues and fix them but also able to predict expected problems in the near future. So, SiteGround uses three different layers to deliver the whopping 99.99% uptime whereas BlueHost also has a secret recipe to provide competent uptime. But they have not revealed anything or which technology they use to achieve maximum uptime. Also, they have not shared any information related to their servers, which is quite weird. Why? Because if it’s super confidential then why SiteGround officially shared which technology they use for outstanding services? And the amazing thing is, one of my team members contact BlueHost support to know their servers details and guess what, they just refused to share. Anyway, take a look on below images to know which host able to provide maximum server uptime. So, we compared the speed, uptime, and response time test, let’s check if both companies can handle sudden traffic spikes. Unexpected traffic can slow down your website or entirely shut it down. Load Impact is one of the best tools to check server capabilities by sending virtual users to your site. Like above tests, SiteGround hosting server accomplished an astonishing stability and performance without showing any load time spikes. BlueHost also bring off the satisfactory result and took around 1.5 seconds to load the complete site. For more details, please take a look on below images. BlueHost hosting server started with a minor spike and then perform quite amazingly to load test site under 1 second which is incredible for such kind of hosting. You can buy cheap web hosting under 2 to 4 dollar, but most of the times it cannot handle unexpected visitors. As you can see, BlueHost is not only a cheap and affordable hosting provider but offer highly stable hosting as well. SiteGround claim to provide sustainable and highly stable hosting and just look at the below picture. Web site hosted on SiteGround hosting server performed normally without showing any load time spikes which clearly indicates that they are right what they claim. Your web hosting should be fast enough to response as soon as it gets data receiving request, it is also known as “Time to First Byte”. I use different services to check server response time like WebPageTest, Bitcatcha and some other tools. In this SiteGound and BlueHost hosting comparison, I have used BitCatcha to test response time through 8 different locations simultaneously. For highly accurate and unbiased results, I checked each host for three times and picked the best result. Here again, keep in mind, each site contains few plugins, premium theme, and the same page size as well as cache settings. SiteGround hosting managed to deliver incredible TTFB speed which shows that their server management and infrastructure build in a way to provide high speed hosting experience all around the world. No matter your visitors are from Asia or Europ, they get super fast speed. Even you don’t have to install CDN service. BlueHost also perform good and provide an acceptable TTFB response but I have seen many fluctuations in their server upon various tests, and in worst scenario, I got C grade. On the other side, SiteGround servers are way stable to handle massive traffic without slowing down your hosting server. SiteGround has an enterprise level hosting solution, SSD storage, SuperCacher, NGINX, and CDN integration which help you achieve maximum speed even in the very basic plan. You get all of these features at the very affordable prices. That’s is why between BlueHost vs. SiteGround, speed conscious users like me should prefer SiteGround. Linux Containers (LXC) is the most efficient and resources saving technology that SiteGround integrated with their platform to deliver highly stable hosting. It also scale system resources to handle sudden unexpected traffic. Their developed Linux Kernel is now part of official Linux Kernal. That’s is why sites hosted on SiteGround perform twice faster than BlueHost. BlueHost don’t have any cache technology on their servers and they also have not shared any official information about the topic. With BH, you’ll have to use third party plugin to optimized your websites. SiteGround offer “SG Optimizer” for WordPress, Joomla, and Drupal. So, you can use it with any major CMS available in the market. Almost all the hosting provider give some exclusive freebies to new customers like domain name, marketing credits, and hosting discounts. BlueHost award you a free domain name for the first year when you buy web hosting account for at least one year. So, it is a flat $12 saving. While SiteGround recently made a change and excluded free domain names from all the shared hosting plans. So, if you planned to use SG for hosting your website then buy a domain separately. Web storage is an online place where you upload or store all of your website’s files like PHP, HTML, CSS, Images, Videos, and Java Scripts, etc. Both BlueHost and SiteGround don’t allow unlimited storage space for the basic plan. Even though, SiteGround doesn’t offer unlimited storage for the higher plans. Although, BlueHost let you store unlimited data in “Plus” and “Prime” plans. The basic plan by BlueHost includes 50 GB of web space which is 5 times higher than the SiteGround’s StarUp plan as it presents only 10 GB. Their “GrowBig” and “GoGeek” packages support 20 GB and 30 GB respectively. It’s a clear win for BlueHost. For starter and newbies, 10 GB is still enough to maintain a small or newly created website within budget. If storage and monthly visitors isn’t your issue, then feel free to choose SiteGround. Which type of storage devices or technology both hosting providers use to store your data? The latest SSD technology is very famous nowadays to render data way faster than the mechanical drives. BlueHost still rely on traditional spinning drives whereas SiteGround offer super fast SSD powered web hosting for shared and cloud plans. SSD drives not only fast but more reliable than spinning drives. These drives consume less power but highly efficient and run for years. And of course, these are much expensive as well than old drives. SiteGround is one of the few hosts who provide SSD storage for shared hosting users to store your website contents and database on cutting-edge SSD’s. That is why sites hosted on SG servers loads faster than any other shared hosting provider. Bandwidth can be defined as “Data transfer to your site visitor’s browser when he/she browse your website”. For instance, when we browse any website our web browser sends a request to received data from that site’s server which is called Bandwidth or data transfer. Both hosting provider, allow unlimited bandwidth for all plans. So, your website can handle unmetered amount of visitors until it hit the higher limits. But SiteGround’s StartUp plan allow 10,000 monthly visitors. However, BlueHost doesn’t have any visitors limit. Branded email address is imperative to take your business to the whole new level. You can create multiple email addresses to manage all the tasks in a professional way like specific ID’s for sales, technical team, developers and content writers. You can create 25 email accounts with BlueHost and allocate maximum 100 MB for each account. Although, SiteGround allows unlimited emails for all plans. No matter, which plan you buy, they support limitless email addresses. So, you have created professional email account but where you can manage that account? Well, both web hosts provide multiple email clients such as Horde, SquirrelMail, and RoundCube. You can also use other services like Outlook and Gmail to handle emails and communicate with your clients or visitors. It is recommended to choose the nearest data center to your website visitors as it plays a vital role for better loading speed. So, you must choose the hosting server wisely and contact your hosting provider to know servers locations. Most of the companies offer one or two data centers for shared hosting users. In fact, BlueHost also has one data center which is located in the USA. You might be fall in love to know that SiteGround has 5 data centers which are located strategically around the world. So, you can select the appropriate server for your website which is highly suitable for businesses who planned to target local audience. A simple yet easy to follow hosting control panel save you a lot of time which can be utilized in your tasks like writing article, website audit, or graphic designing. All the well-name hosts offer a control panel known as cPanel and it’s quite popular among hosting business. BlueHost and SiteGround offer cPanel control panel to manage your web hosting account, there you can manage site contents like HTML, PHP, CSS, images, and videos, etc. You can add new domains, create sub-domains, create email accounts, edit DNS records, and also take manual backups. However, BlueHost went beyond the standard cPanel and design it with custom icons and color schemes which feel just awesome. Recently they also integrate some WordPress tools in their control panel to help WordPress users perform the necessary task to manage WP sites. There you can install Let’s Encrypt SSL with 1-click button. Not taking regular backups of your website is one of the common mistakes which bloggers usually made. It could cost you money, traffic loss, and in worst scenario entire site lost. That’s why you must create regular backups to secure your website from any unwanted situation. Building a successful blog takes time, a long period usually years of hard work. SiteGround create a daily backup of your content in their in-house build custom backup system. It retains backup copies of last 30 days for all plans except StartUp and at the time of restore, just contact the SG support. Here keep in mind, they charge few bucks for restoration. BlueHost also presents a backup system which takes daily, weekly, and monthly backups. The best part is they don’t demand any charges for restore like SiteGround. Basic plan allows individual file restoration, but for an entire site, you’ll have to buy “Site Backup Pro”. Here both hosts have certain limitation, one demand fees for restoration and other allow individual files recovery. In my experience, SiteGround keeps an entire copy which can be restored at the cost of few dollars whereas BlueHost also create backups, but it’s only useful when you regularly download to your computer which is time consuming. Google loves HTTPS powered websites and gives a minor edge over non-https websites? Yes, you can also take the benefits of getting good ranking by implementing SSL certificate. Positive SSL and Comodo SSL can cost you around $15 to $40 per year which is a hefty amount for money conscious bloggers. But both companies give you a free SSL certificate which can be installed directly from the control panel and take few minutes to activate. You just have to click on one button, and you’re good to go. They offer free SSL certificates by Let’s Encrypt. cPanel comes with one-click script installers to install any major CMS like WordPress, Joomla, and Drupal within few clicks. It not only save time but also technical tasks like creating database and username, connecting database with WordPress core files, and other things like that to create a website. But One-click installer helps you install WordPress without learning technical skills, and it takes few minutes. In this SiteGround vs. BlueHost comparison, both companies give you one-click install feature, and it’s highly suitable for non-techie users as well as novice bloggers. So, your site grows exponentially, and you’re planning to move to higher resources rich hosting plan. Are you familiar with website migration? If yes, then no problem otherwise you might be stuck in many issues. Migration is not that simple as some users think. A simple change in code can entirely destroy your website. But here is great news, both web hosting services have a flexible and easily scalable system. You can migrate to higher plans without changing hosting server. Just choose the plan comes with large storage, ram, and CPU resources and pay for that. Your hosting provider will upgrade the plan within few minutes. If upgrading requires site transfer, your host will do it without asking extra money. And your site will never face any downtime during the upgrade process. Content Deliver Network or CDN is the best way to increase site speed significantly if you cannot afford expensive web hosting but still want a fast loading website. CDN providers distribute hundreds of server all around the world strategically to load your site content from a CDN server near to visitors. As I described above in “Number of Data Centers” section, lower distance from the data center to your site visitors helps decrease loading time. Content Deliver Network services place their data centers globally which result in improved site speed. You can activate CDN easily with a one-click button no matter if you are using SiteGround or BlueHost. Both web hosts integrated CloudFlare within their Control Panel. You just have to hit the CloudFlare icon through hosting dashboard and enter your CloudFlare account credentials. That’s it, Isn’t simple? For non-techy users who don’t have any WordPress, Joomla, or Drupal experience but still want to start a website can use drag and drop site builder to design awesome looking site within minutes. Drag and Drop Builder is perfect for business and individuals who just want a website. Each company SiteGround and BlueHost offer a free website builder with dozens of free templates to build any type of site within few minutes. It also allows customization as per your need to create a unique design. This builder can be used right from the control panel. Domain parking is a convenient feature to secure your brand names from being used by other companies or individuals. You can park domains similar to your brand name and when someone visit by typing that domains in the web browser, they redirect to the main domain. Let’s say you have a primary domain name mytipshub.com and you want to secure mytipshub.net and mytipshub.org. Then you just have to buy these domain names and park them. When someone type with .net or .org extension, they will land on the .com page. Otherwise, third-party users can buy these variant names and use them to steal some of your traffic. SiteGround permits unlimited domain parking for all plans, StartUp account users also can park unlimited domains. On the other side, BlueHost allows a small limit of 5 parked domains. Are you an existent hosting user or planning to change current web host? Well, in that case, you should know the migration procedure. It is time consuming, need technical skills, and unsuccessful migration could destroy your website entirely or partially. If you’re not familiar with this migration stuff, just contact your hosting provider. They will do it at some cost or free. SiteGround transfer your website to their servers without charging any money. But with BlueHost, you will have to pay a massive amount of $149.99 per transfer which is weird and too much for such kind of task. Would you like to pay $149.99 just for website migration? It is more than the one year basic web hosting account. They should revamp migration fees and offer at no cost like SiteGround. Security is the biggest issue in shared web hosting and many times if someone’s account got hacked it also opens security loopholes to hack other accounts on the same server. That said, if one account compromised chances are other accounts may also face security risks. Shared hosting users frequently face this issue if their web host failed to implement latest security patches and protocols. SiteGround was the first web host who introduced CHROOT account isolation in 2008 to secure all the accounts on a shared server. Before that, many providers were unsure if it’s possible. So, SiteGround has tight security protocols and secure your data more than any host. BlueHost also have bulletproof security measures, but they never revealed which technology they employ. I would like to choose SG as they are more transparent than BlueHost. You can host one website with the basic plan of BlueHost and SiteGround. For more, you have to subscribe for higher plans like “Prime” or “Plus” by BlueHost and “GrowBig” or “GoGeek” by SiteGround. If you want to create a new blog, then choose any one as per your needs. You can host unlimited sites on all plans except the very basic plans. However, SiteGround has storage limitation for all packages while BlueHost permits unlimited storage. BueHost give $200 free marketing credits to drive instant traffic through Google and Bing. These credits are available for specific countries and can be availed when you buy “Prime” and “Plus” plan. Yes, no credits for “Basic” plan. SiteGround doesn’t offer any marketing credits for any plan even for higher packages as well. Keep in mind, these credits allowed for the USA and Candian users only. Staging proves very handy to try new themes, plugins and deploy codes. You can create a clone of your main website and try new stuff on cloned site to check if latest updates or codes works fine without any conflicts. It’s the best approach to avoid downtimes and site errors. SiteGround help you create the staging environment for WordPress, Joomla, and Drupal CMS. Whereas BlueHost doesn’t offer any staging feature right now. Most of the companies, allow this feature for expensive plans but SG offers it even for the “StratUp” plan. So, SiteGround also has the edge over BlueHost in this section, but if it’s not an essential feature for you, you can ignore it. And it’s also a little bit developers related stuff. File Transfer Protocol or FTP is the easiest way to upload or download files from your server to computer or vice versa. Downloading huge files directly from the control panel isn’t that easy because hosting server close the connection after a certain time which causes download files termination. But FTP access or FTP client can be a life saver to download huge files. It is easy to configure, you just have to enter username, password, and origin server to communicate with your server. Usually, all the web hosting provider allow unlimited FTP accounts to create various accounts. No matter if you’re going to use BlueHost or SiteGround, each host allow unlimited FTP accounts. You can set up any PHP version from 5.4 to 7.1 according to your requirement, and it can be changed straight from the cPanel. CMS like WordPress always perform seamlessly with the latest PHP version and execute code fastly. With the update of recent 7.0 version, you can see how it improved the overall website loading and data execution request in the below image. Both users can update PHP setting right from the control panel with few clicks. It is highly recommended to use updated PHP version for enhanced server performance. For more information, visit this page. SSH means “Secure Shell Access” and it able you to connect to the server using a secure protocol. Generally, most of the bloggers and individual webmasters use FTP clients (FileZilla) to upload/download content. But, FTP protocol is vulnerable and insecure. So, if possible always try to use SSH gateway to handle hosting account. Anyway, if you like to use SSH, both providers include it within all plans even for the basic users. Cron jobs help you automate a specific action after a certain amount of time. It could be a daily task or one-time action. For instance, to avoid storage outage or delete temporary files, you can set up daily, weekly, or monthly disk clean up to remove unnecessary files. Well, bloggers like me and you who just focus on contents sharing, this feature is pretty useless. You can configure Cron Jobs with both web hosting providers through the control panel. But you must know Linux commands before implementing any command. SiteLock encourage individuals and business to scan their websites for malware, suspicious links, virus, and vulnerabilities. It regularly monitors your websites to detect suspicious malware as well as XSS and SQLi vulnerabilities. SiteLock also plays a vital role to identify if every server port is open for the right server type. In a nutshell, SiteLock is very handy to detect and monitor websites, applications, server ports, and static application for vulnerabilities. Luckily, you get a basic plan from BlueHost without paying a single penny. Your host should have multiple ways to contact the customer support anytime whenever you need them. Usually, web hosts help their clients via live chat, call, email, and support tickets but you should choose a company which offers support via live chat and phone call. Because when you face any hosting issue, would you like to wait for hours to get the reply from your host? Of course, a big no. Personally, I also check these two methods before buying web hosting. You get 24/7/365 customer support via chat, phone, and ticket system from both BlueHost and SiteGround. However, when I compared the response time of both companies no matter if it’s live chat or phone, SiteGround respond within a minute. In fact, sometimes in seconds which is unbelievable. They are known as best of the best when it comes to technical or customer support, and their staff is highly trained to fix all of your issues. You might be surprised to know that, they only take 15 minutes to fix complicated issues, and minor issues take no time. BlueHost also has a good support, but when I contact their support I noticed that BH technical staff feels little bit non-techie. They also take too much time to understand the issue which sometimes frustrates the user. But at the end, most of the times, they fix the problem or recommend some tips to follow. For highly trained, quick, qualified, and expert support I always recommend SiteGround. So, if you don’t like to wait for hours, then feel free to go with SiteGround. Now let’s compare which one in SiteGround vs. BlueHost provide most affordable and reasonable web hosting plans. They offer pretty similar features when we compare the web hosting features except for few ones. There is a significant pricing difference between both web hosts like SiteGround charge $3.95/month for one year plan since BlueHost demands $5.45/month to get one year subscription. You have to buy a 3-year plan for the lowest rate of $3.95 per month. But SiteGround doesn’t force you to subscribe for 2 or 3 years because they have the same prices for any subscription no matter if you’re going to buy for 1, 2, or 3 years. BlueHost advertise $3.95 per month on their homepage, ad campaigns, and social media marketing but when you pay for at least three years. SiteGround also offers monthly subscription at the cost of $3.95 with some setup fee. With BlueHost, you can avail yearly plan because they don’t have monthly billing option. As you see SiteGround has most economical and affordable prices when compare with BlueHost. So it is recommended to buy SiteGround hosting when it comes to inexpensive WP hosting with stable servers, 99.99% uptime, bullet-proof security, and 24/7 quick support. You can get your money back within 30 days from the date of signup from both providers as they offer one-month money back guarantee. So, new users can try their services for the whole month and refund money if found issues in their hosting which does not happen in most of the cases especially SiteGround. As refund duration is same, so it’s a definite tie. In this BlueHost vs SiteGround review, you can see after doing all the essential tests and features comparison, SiteGround is a clear WINNER. Except monthly visitors and small storage limit, you get a lot of stuff and unique features like SuperCacher, free SSL, free data backups, pro-active site monitoring, and auto updates. Their prices for hosting plans are also reasonable and anyone who want to start a website can avail all of these stuff at the cost of just $3.95 per month. For high speed hosting, whopping 99.99% uptime, and anytime super fast technical support, I highly recommend SiteGround. So, which one between SiteGround vs BlueHost you think is the best one? Please share your thoughts in the comment section below and don't forget to share this article on social media.